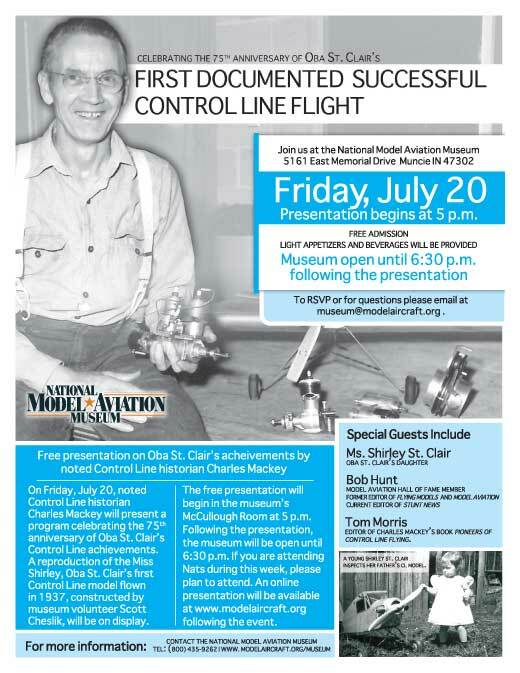 Oba St. Clair's contribution to model aviation ranks among the highest of the highs in the 20th century. His invention of control line powered flying in 1936, using a bellcrank, dominated the hobby for almost 40 years. It is an indisputable fact that he was the true inventor of control line powered flying, as proven by the testimony of 100s of people, newspaper articles, dated plans, model airplane advertisements and court records. A United States District Court Judge named Oba St. Clair "The Father of Control Line Flying". St. Clair only received recognition for his contribution in model aviation in his later years due to his modesty. He did not believe in "blowing his own horn"
His contribution to model aviation was a life-long endeavor. It would be difficult, if not impossible, to find anyone who has contributed more to model aviation than Oba St. Clair.